Porsche made it back to the GT Le Mans class podium for the first time in three races Sunday in Monterey. 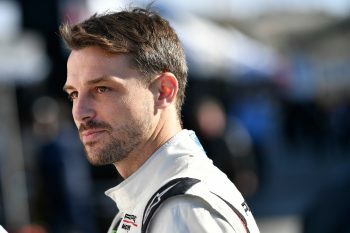 Earl Bamber and Laurens Vanthoor dodged incidents and saved fuel to bring home a runner-up finish in the second-to-last IMSA WeatherTech SportsCar Championship race of the year. Bamber managed to avoid several crashing cars at the start of the race. Contact between two prototypes then inadvertently affected two GTLM cars, one Ford and the other Porsche 911 RSR in class. Once the New Zealander weaved his way through, the Porsche GT Team opted to take the No. 912 car off strategy early to set themselves up for the rest of the race. After Bamber handed over to Vanthoor, the team would need to make it nearly 80 minutes on fuel and Michelin tires without a splash. They did so and nearly captured their second win of the year. Second was a good result for the pair of young guns, and marked their fourth podium finish of 2018. “The main issue at the start was that not everyone got packed up. Everyone came in super quick to try to pack up and it caused a big concertina,” Bamber explained. Of the fuel save strategy employed to the finish, Bamber added, “We knew we had to save the maximum from the beginning of the stint. We started saving immediately. “To be honest, we didn’t have the pace of either the Corvette or the BMW. “We tried to save the max and hope the others couldn’t make it. Everyone but one made it. Tandy limped his wounded No. 911 car back to the pits after having nowhere to go at the start. It forced he and Patrick Pilet’s car into an early retirement. 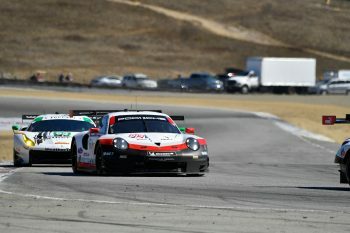 Bamber, Vanthoor and others from the Porsche team will be back in Northern California at Monterey for Porsche Rennsport Reunion VI later this month, Sept. 27-30.